click: Gain 2credit for each hosted virus counter, then remove all virus counters from Consume. "It 'ate' the vertex grid?! What does that even mean?" If the Runner has both Consume and Hivemind installed, each with 2 virus counters hosted on them, what happens when the Runner uses Consume? The Runner gains 8 and removes all four virus counters from both Consume and Hivemind. If the Runner plays Apocalypse while Consume is installed, does Consume gain virus counters before being flipped facedown? Yes. 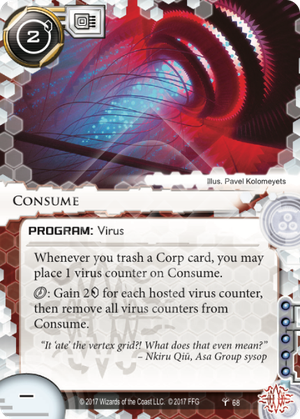 The virus counters then remain hosted on the facedown Consume until the Corp purges, the counters are removed by a card ability, or the facedown Consume becomes uninstalled.